Snapshots of the Upper Gila Watershed. Photo Credits: Arizona Department of Water Resources. Watershed Planning in the Upper Gila Watershed is a five-year project made possible through a partnership between the WRRC, the Gila Watershed Partnership (GWP), and Arizona Cooperative Extension. In 2012-2014, our work in the watershed was funded by a grant from the Bureau of Reclamation WaterSMART program to complete an evaluation of current watershed conditions and develop future scenarios based on stakeholder input. An additional two years of funding was secured from the Bureau of Reclamation through a Desert Ecosystem Cooperative Studies Unit agreement. Through this partnership of local, state, and federal entities, the WRRC seeks to: build upon the previously developed scenarios, help residents in the watershed better understand their water resources, and develop a decision support system for watershed management. This project will develop effective decision making tools for watershed planning on Arizona reaches of the Upper Gila River. The project has four phases, including: 1) Determination of water management needs and objectives, 2) Estimation of water supply and demand and creation of water supply and management strategies and alternatives, 3) Development of metrics, and 4) Creation of a water resources plan. The Gila River originates in the Mongollon Mountains of New Mexico and flows West across Arizona to join the Colorado River at the California border near Yuma. Graham and Greenlee Counties, in the heart of the Upper Gila Watershed, depend on water supplies from the river to support their municipal, agricultural and recreational activities. In this arid climate, water planning is essential to ensure the lifestyle enjoyed by local residents. According to the Arizona Water Resources Development Commission (WRDC), the Upper Gila Watershed will have unmet water demands by 2035. Over the past two decades, municipal water demand in the watershed has increased by 34 percent, while agricultural demand has decreased by only 5 percent. As water users and other watershed stakeholders look ahead to an uncertain future, water management challenges raise several important questions. How are we currently using our water? What trends in water use and water availability can be identified today? How will changes in future water availability as a result of drought, fire and other impacts affect the watershed and its natural resources? This project directly benefits water management in the Upper Gila Watershed by providing new resources to aid the community as it plans for the future. The key to this effort is integrating local stakeholder concerns into the project, instead of generating yet another study. The Assessment will enable water managers and other stakeholders to evaluate the current conditions of the watershed, the potential impacts of climate change on water resources and the environment, and the impacts of management actions within this context. Information and resources generated as part of the Assessment will allow the GWP and other community stakeholders to develop a long-term, comprehensive watershed management plan. Watershed Goal-Setting Workshop Summary This workshop was held on February 18th, 2013 in Safford, AZ, bringing together a diverse group of participants to discuss the challenges in the watershed in order to begin the process of creating watershed-wide goals and actions to achieve these goals. This summary provides initial goals drafted at the workshop and the "fact sheets" for each watershed planning theme we discussed. 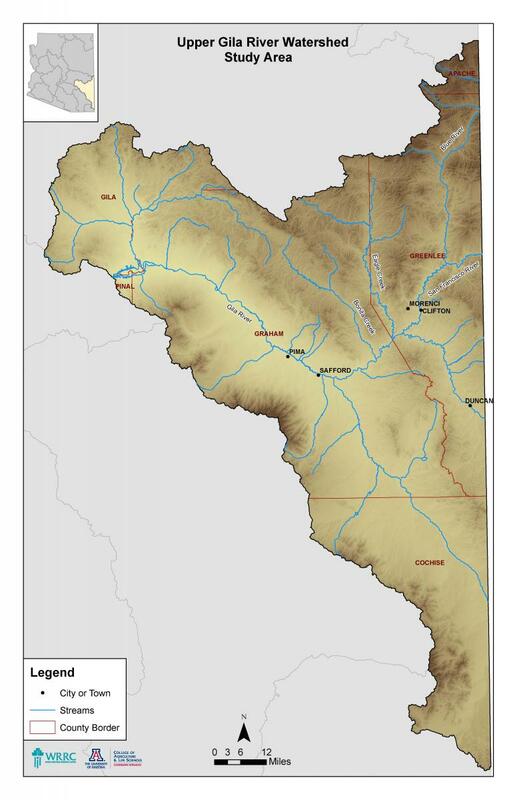 Scenarios for the Upper Gila Watershed This scenario planning document explores possible futures of the watershed as informed by ongoing interviews, meetings, and feedback given from the Gila Watershed Partnership and others, along with research of academic and government sources. These scenarios will be used in water resources planning and management for the watershed. Using Watershed Assessments to Inform Planning in Rural Watersheds This report was published by the University of Arizona Cooperative Extension in July, 2014 and provides recommendations and methods for developing a baseline watershed assessment based on WRRC's experience in the Upper Gila Watershed. 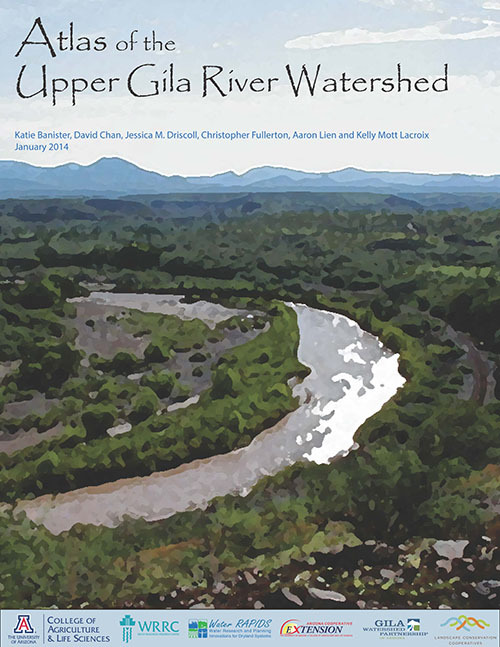 Atlas of the Upper Gila River Watershed (pdf 27 mb) This document is a baseline assessment of the current conditions in the watershed. It includes information on the history, cultural and natural resources of the watershed and how some of those resources have changes over the past few decades. NOTE: Atlas version available at the above link is large and of a lower image quality. For higher quality images download individual chapters or contact us for a hard copy.